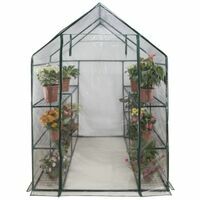 Snap and Grow 6'x8' greenhouse has been engineered to get you growing quickly. Its unique SmartLock connector system allows you to assemble the heavy-duty, aluminum frame quickly and easily without a lot of hardware and the innovative split door and vent windows are pre-assembled out of the box. Polycarbonate panels are impact resistant. 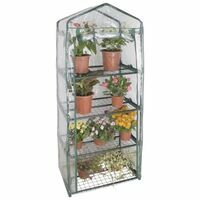 Strong, crystal-clear SnapGlass panels slide and lock into place without any complicated tools or hardware. UV protection means long lasting clarity. Aluminum frame will not rust.